"The Steelers are the Steelers," said safety Reggie Nelson. "We’re going to go in there and play hard-nosed football and we expect the same from them like any other game." "We went through a lull where we were beating the Bengals pretty regularly," said Pittsburgh safety Ryan Clark. "But now with this young group of individuals they have there, all of these good skill players and an extremely good defense, the game has picked up a little bit. I don’t think they necessarily understand the history, or know the history, nor care about it. So I don’t think there’s a lot of respect for the Pittsburgh Steelers in Cincinnati. "Those guys play hard, they play that way. They talk. And for me, it’s exciting. It’s always good to play against good players who feel like they’re better than you. It’s a good game for both teams." "We take big emphasis on that tackling. 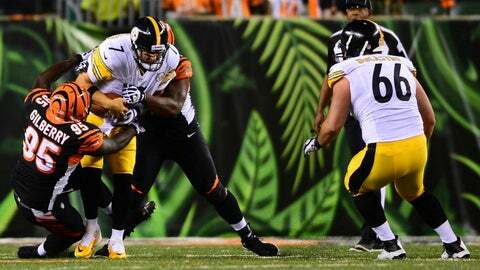 Especially me, I hate missing tackles," said linebacker Vontaze Burfict. "I think I missed two tackles last game. For me, I realized, man, I need to bend my knees more in practice or wrap up in practice. I think that’s going to be a lot of emphasis today. Reggie Nelson is kind of mad we have pads on so I’m pretty sure he’s going to hit somebody in practice." "We went through like eight plays. Pretty much just the bad plays," said Burfict. "You’d probably have to put some earplugs in." Nelson has interceptions in each of the last two games against Pittsburgh. He concurred when it came to Zimmer’s reaction and ranking it among the most audible of the coordinator’s other film breakdowns: "I think it’s off the charts, to be honest with you. You’d better make eye contact or he’s just going to keep going. You’ve just got to sit there and accept the coaching and move on. You know you did something wrong." "There’s definitely a rivalry that you feel," said quarterback Andy Dalton. "The Steelers have been a good team for a long time. You can feel it."